Sylvia S. Bening, age 94 of Arlington passed away Thursday, November 29, 2018 at Oak Terrace Health Care Center of Gaylord. Funeral services will be 11:00 a.m. Monday, December 3rd at St. Paul’s Ev. Lutheran Church in Arlington. Visitation will be 4:00 – 7:00 p.m. Sunday, December 2nd at the Kolden Funeral Home in Arlington with visitation continuing one hour prior to service time Monday at the church. Interment will be at a later date in the Arlington Public Cemetery. Sylvia was born on May 26, 1924 in Green Isle Township, Sibley County to Charlie and Bertha (Litzau) Voigt. She was baptized and confirmed at St. John’s Ev. Lutheran Church of Helen Township, rural Glencoe. She attended District 45 Country School and St. John’s Lutheran School through the eighth grade. Sylvia worked at the Gaylord and Arlington Nursing Homes as a kitchen aide, as a custodian for the Arlington – Green Isle Public Schools and did assembly work at Hands, Inc. in Winthrop. 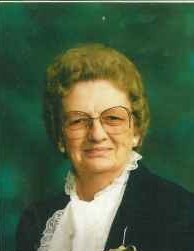 Sylvia is survived by two sons; Curtis Bening and Allan (Jean) Bening, daughter-in-law; Nancy Bening, grandchildren; Beth (Paul) Otto, Brian Bening, Christy Bening, Stacy (Clint) Timmerman, Carly Bening, Dustin Bening and Ben Venske, 8 great grandchildren, 2 great great grandchildren. Sylvia is preceded in death by two sons; Elwood and Mark, granddaughter; Megan Bening, parents; Charlie & Bertha Voigt, Sister; Hattie Born, Brother; Carl “Sonny” Voigt.